Order picking is a key process in distribution and warehouse premises and consists of taking and collecting items in a specified quantity before shipment. Order picking is part of any basic warehouse process and has an important effect on the productivity levels of the warehouse or distribution centres productivity. It is for this reason that that obtaining the most appropriate order picking and step trolleys is an absolute essential element of warehouse control. 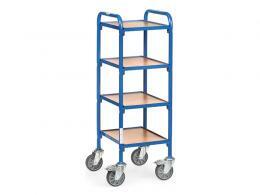 If you have the correct type order picking and step trolleys for your warehouse or distribution centre it is inevitable that you will see an impact on productivity levels. 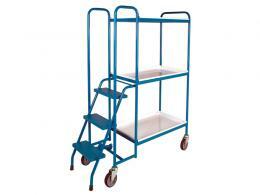 The Workplace Depot has a comprehensive range of order picking and step trolleys to ensure that your increase in warehouse or distribution centre productivity is supported. 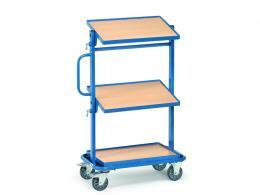 The Fetra Trolleys where stated are available in any RAL colour although you must state this in the comments field when ordering & we will contact you for details. 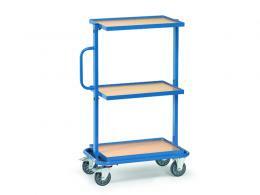 There are 12 different types of order picking and step trolleys, all of which are provided in a number of different variants to ensure that you will be able to choose the right order picking and step trolleys for your specific industry requirements. 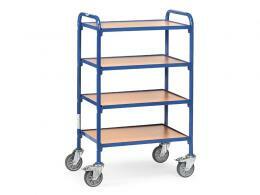 Amongst the range of order picking and step trolleys is the 4 shelf heavy duty step trolley. 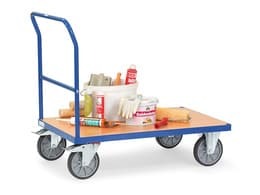 This step trolley is particularly strong and robust and is perfect for heavy stock thanks to its zinc coated tubular framework; it has an overall load capacity of 300kg with the top shelf able to carry a load of 150kg. 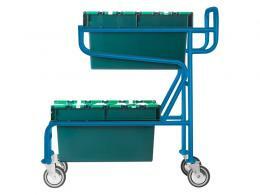 The 4 shelf light duty step trolley is ideal for lighter items and is easily transportable thanks to its robust swivel castors.